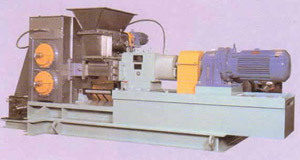 Mixing and Compression Granulating Machine MRCP Roller Compactor | Product Information | KURIMOTO, LTD.
By combining the MRCP Roll Compactor with two-shaft self-cleaning type kneading machine to have raw materials intruded between the rolls, you can gain a variety of features, which could not be provided with previous dry-type compression granulating machines. The MRCR Roll Compactor has a two-shaft self-cleaning type screw, which maintains stability of processing capability even with adherent materials. Screws are segmented for ease of replacement when worn and torn. By installing kneading paddles, you can achieve adding binder and granulation in one system. The MRCR Roll Compactor is available for mixing, compression, and de-gassing as the pretreatment equipment for kneading machines, enabling you to increase the kneading capacity.